Like I said before, the place I stay has people from Kashmir to Kanyakumari. I put this Kashmir thali too with a neighbour’s help. The restaurants had me believe that Kashmiri food was all sweet and nutty. Now, that’s far from truth. You get really spicy food there, mainly non vegetarian.Given that Kashmir is a very cold place, it makes a lot of sense. My neighbour also suggested radish chutney (its more of a salad, if I am right) and lotus stem curry. I was not able to get these two things, else I would have loved to feature them also here. Another thing I learnt was that their regular cooking doesn’t include onions and garlic much. If I remember right, turmeric powder is also not used much. The Kashmiri chilli/chilli powder is a must, though. This khatte baingan was a new recipe for me. This is eggplant cooked with tamarind (khatte means sour/tart). Next was the saag. The Kashmiri saag is not easily available here. It’s the knol khol/kholrabi’s leaves. I used a bunch of palak (a variety of spinach) for making this saag. I followed a recipe on-line to make this simple green leafy preparation. I took a lot of short cuts here and so mine weren’t the royal dum aloos, just ordinary ones :D. I didn’t deep fry, I didn’t even shallow fry the potatoes. Those are just boiled potatoes in the curry. In my enthusiasm, I overcooked the gravy and so ended up with a thicker curry. But anyway, it tasted fine, so no complaints there. 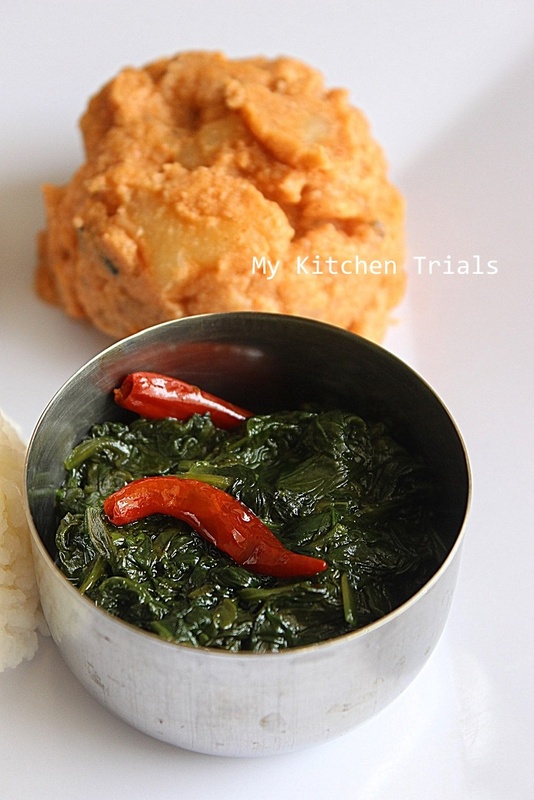 Kashmiri Dum Aloo : A Kashmiri spicy potato preparation, with yogurt. 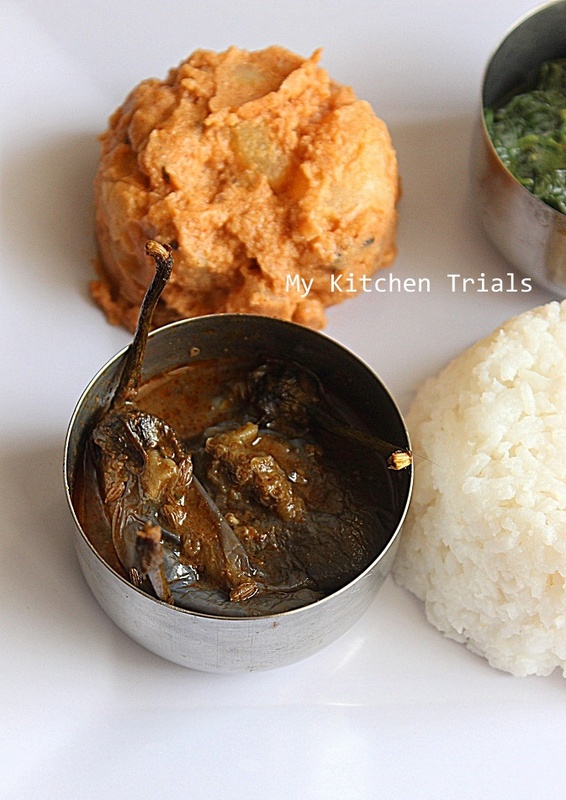 Khatte Baingan : Brinjal cooked in tamarind, sour and tangy in taste. Saag : Green leafy preparation using palak spinach. Rajani even i thought that Kashmiri foods are sweet and nuts stuffed dishes until i bought a Kashmiri cookbook. Your Kashmiri platter is very comforting with healthy foods. Kashmir is heaven..full of beauty and amazing food..they have rich as well as simple dishes..I too love their saag , dum aaloo is a signature dish, wish you could have got lotus stem..the set up is amazing and the combination is perfect..needless to talk about clicks:))..Super as ever. When I grew kohlrabis a few years ago, I had used the leaves and they were on slightly bitter side. I bet spinach tastes a lot better. I would like to try that baingan dish. 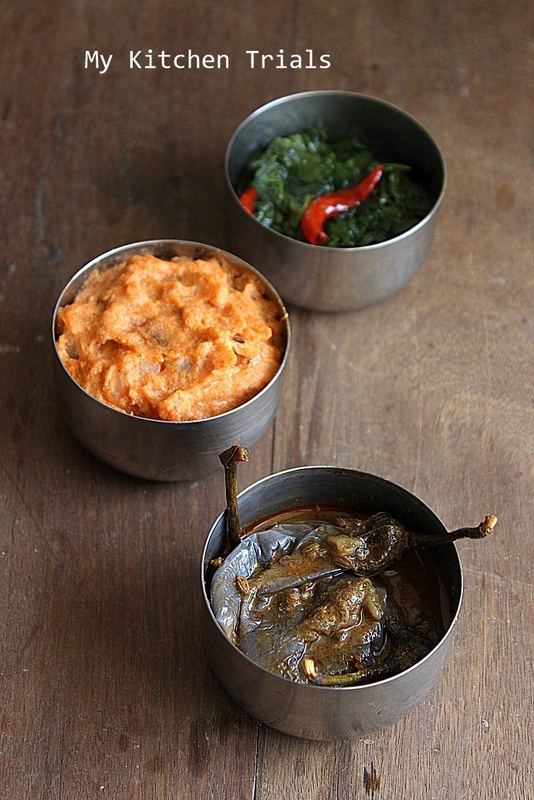 Such beautifully made dishes..all three of them are looking so inviting.. Both kohlrabi leaves n kohlrabis are very popular up there in the north. 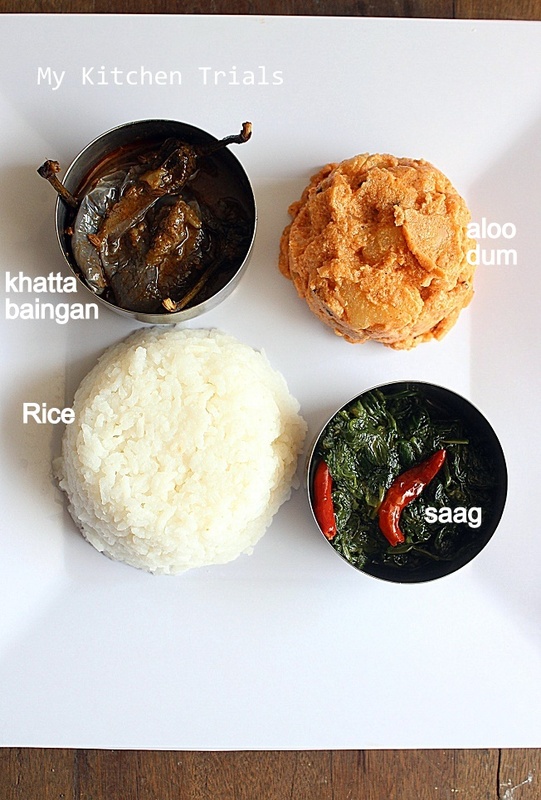 Very neat representation of J & K.
That khatte baingan is calling my name. All the dishes sound simple and easy enough to make. Simple and comforting dish, Looks great dear..